What are the penalties for DUI in Texas? Quotes from Drunk Driving Accident Victims represented by Justin Hill. What does dram shop law mean? Mothers Against Drunk Driving (MADD) ranks Texas the second worst state for drunk driving accidents in the U.S. 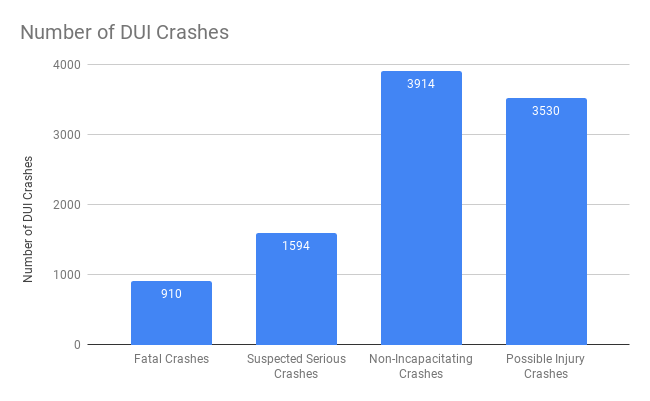 According to MADD there were about 1,300 reported fatalities as a result of drunk driving in 2011 – accounting for 42% of overall accident fatalities in Texas. Drunk driving has since continued to be a very serious problem in Texas and has led to the injuries and wrongful death of many innocent Texans. If you or a family member have been injured or wrongfully killed as the result of a drunk driving accident, you need an experienced and reliable San Antonio drunk driving accident lawyer to stand up for your rights. Personal injury attorney, Justin Hill has served on the advisory council for MADD South Texas for many years, and he has years of experience in handling all the issues that arise from drunk driving accidents. It is important all of these avenues are explored to protect the rights of those injured or wrongfully killed by drunk drivers. At Hill Law Firm, the attorneys at our San Antonio firm not only fight to make sure victims receive compensation for their injuries but they also try to change policies to keep the public at large safe. Overall, about 90,000 Texas drivers are arrested each year on DUI charges. According to at least one study, the average person drives drunk more than 80 times before they get into an accident or get arrested, which makes the situation potentially very scary. However, these numbers don’t mean the state of Texas is doing nothing about the problem of drunk driving. In 2015, the Texas legislature passed a law it hopes will improve those troubling statistics. Among the provisions in the new law is one in which many who are convicted of drunk driving will only be eligible for a provisional driver’s license that will require them to install an ignition interlock system, complete with breathalyzer, in their car, so the vehicle can only be started if there is no alcohol in their system. This allows offenders to continue to fulfill their work and family obligations while assuring the public that they’re not driving under the influence. According to MADD, such systems have reduced drunk driving deaths as much as 30-45 percent in some states. People should also be aware that Texas has what are called “dram shop laws.” While the driver is almost certainly at fault in a drunk driving accident, there are often others who may have been negligent along the line and who should be held responsible. For example, another negligent party could be a bartender who decided to serve the driver too much alcohol. In other cases, it could be someone in a position to prevent the driver from getting behind the wheel. Perhaps someone could have taken the keys and called a cab, but instead handed them the keys and failed to call anyone. In any accident involving someone who was driving drunk, a thorough investigation must be conducted and a number of factors have to be considered. A lot more must be done to stop drunk driving in Texas. Police departments throughout the state are trying to do their part by conducting more DUI task force operations, but they currently are not permitted to set up sobriety checkpoints. One reason is that courts have ruled that, at a minimum, sobriety checkpoints must be “authorized by a statewide policy governing checkpoints.” There is no statewide policy in Texas. In the end, the people who make the terrible decision to drive drunk must realize that they are putting innocent lives at risk. There need to be stricter laws and better community outreach programs, which means we all must demand that. 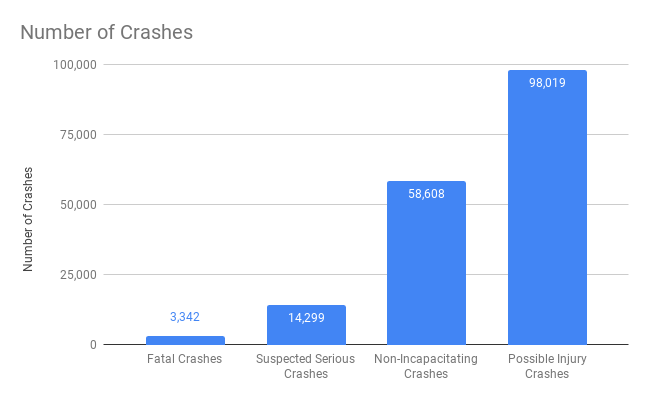 To put things into perspective, we looked at the difference between the total number of car crashes and the number of car crashes involving alcohol use. When we analyzed the data, our findings were alarming. Although DUI car accidents with a possible injury count for less than 0.5% of all car accidents with possible injury, the number of DUI car accidents with a fatality count for almost 30% of all car accidents with a fatality. This just shows how severe the effects of driving under the influence are on our community. Unfortunately, the results are fairly similar. 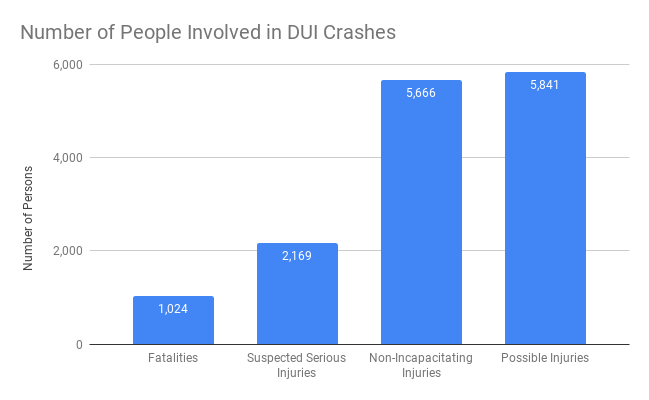 The number of people involved in a DUI crash with a possible injury counted for less than 0.04% of the total number of people involved in car crashes. 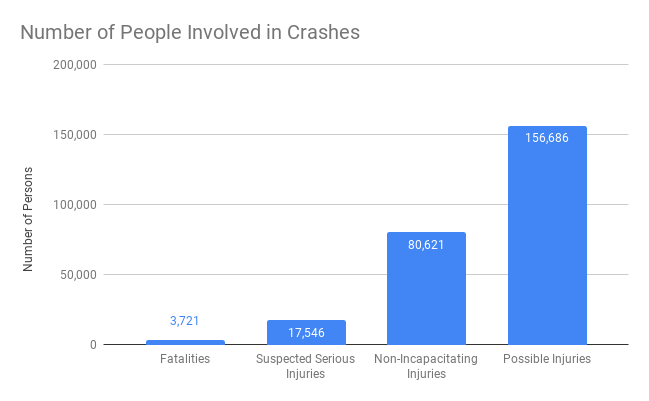 On the other hand, the number of people involved in a fatal DUI crash counted for a little over 27.5% of the total number of people involved in a fatal car crash. In 1993, the National Transportation Safety Board, in collaboration with the National Institute on Drug Abuse, performed comprehensive drug screens on blood specimens from 168 truck and bus drivers from 8 states who were fatally injured while operating an 18-wheeler, commercial truck/trailer, or commercial bus. One or more drugs were found in a staggering 67% of the drivers tested, with 33% testing positive for alcohol or psychoactive drugs, including marijuana, cocaine, amphetamine, methamphetamine, and ephedrine. Our San Antonio truck accident lawyer has experience handling accidents involving intoxicated truck drivers. Call us for a free initial case evaluation. In a recent roadside inspection project conducted by the Commercial Vehicle Safety Alliance (CVSA), 1% of all truck drivers stopped at the roadside inspections were illegally under the influence of alcohol or drugs. This equates to 100,000 truck drivers nationally who are abusing alcohol and drugs while driving large commercial vehicles. Unfortunately, many within the industry think the number may be double — 200,000 — due to the fact that roadside inspections are announced months in advance and the exact locations for the inspections are disclosed to the trucking industry. Unfortunately, many instances of substance abuse go undetected within the trucking industry due to industry-wide cheating on drug tests. Magazine publications for truckers advertise products that allow drivers to hide their substance abuse problems by skewing the results of drug tests. Between April 30, 2012 and May 11, 2012, the drug and alcohol strike force of the Federal Motor Carrier Safety Administration (FMCSA) performed a 2-week sweep, searching for commercial truck and bus drivers who were under the influence of drugs or alcohol. As a result of their efforts, 287 truck and bus drivers were removed from the road and banned from operating commercial vehicles and 128 companies face enforcement actions due to drug and alcohol violations. Unfortunately, this sweep only took place in Washington D.C. over a 12-day period. Imagine what the numbers would be if this sweep would have occurred on a national level. Dram Shop Liability refers to the body of law that imposes liability on sellers of alcohol to obviously intoxicated patrons, and sometimes minors. If a seller of alcohol provides alcohol to an obviously intoxicated patron, they can be held liable for the actions of that patron. Dram shop cases typically involve individuals getting intoxicated at a bar and then hurting someone in a drunk driving accident afterward. The recipient’s intoxication proximately caused the plaintiffs injury. If you have been injured or have lost a loved one as the result of a drunk driving car accident in San Antonio, do not hesitate to contact our personal injury lawyer for questions or a free case evaluation. It is extremely important to move quickly to make sure your rights are protected, evidenced is preserved, notice letters are sent and that you are given the best opportunity to receive the justice you deserve. Call today at, 210-960-3939.